Endodontic treatment can safely and comfortably save a tooth that otherwise would have to be removed. In fact, root canal therapy is successful approximately 95% of the time. Remember, a healthy restored tooth is always better than an artificial one. Why couldn't’t you just remove the tooth? The choice is yours, but there are many disadvantages to losing a tooth. When a tooth is removed and not replaced, the teeth next to the empty space begin to shift from their normal position. 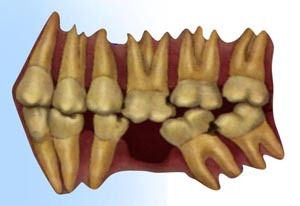 This may cause teeth to become crooked or crowded, which decreases chewing and biting efficiency. Crowded or crooked teeth may be more prone to dental disease because they are harder to keep clean than properly aligned teeth. As a result, other teeth may be lost if the missing tooth is not replaced. A replacement tooth (an implant or a bridge) is usually more expensive than Endodontic treatment and involves more extensive dental procedures on adjacent teeth. When the pulp is diseased or injured and unable to repair itself, the pulp dies. The most common cause of pulp death is tooth fracture, trauma or a deep cavity that exposes the pulp to saliva. The bacteria found in saliva cause infection inside the tooth. Left untreated, the infection eventually causes the pulp to die. 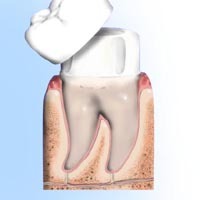 Pus can build up at the root tip, forming an abscess than can destroy the supporting bone that surrounds the tooth. If the damaged or diseased pulp is not removed, the tooth and surrounding tissues become infected. Pain and swelling may accompany the infection. Even in the absence of pain, certain by products of a diseased pulp can injure the bone that anchors your tooth in the jaw. 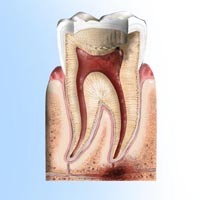 Without Endodontic treatment, your tooth will eventually have to be removed. 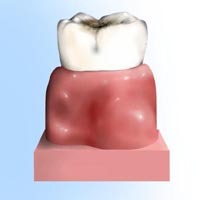 First, the tooth is isolated from the saliva with a rubber dam (a sheet of rubber placed around the tooth). 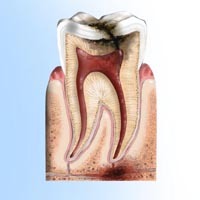 An opening is then made through the crown of the tooth into the pulp chamber. You may be given a local anesthetic prior to this step so that you will be more comfortable during treatment. 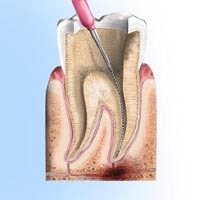 The pulp is then carefully removed from both the pulp chamber and root canal(s). The root canal(s) is cleaned, enlarged and shaped to a form that can be properly filled. Medication may be put in the pulp chamber and root canal(s) between appointments to help eliminate bacteria and prevent infection. A temporary filling will be placed in an opening in the crown of the tooth to protect the pulp chamber and root canal(s) between visits. If the pulp was severely infected, your dentist may leave the tooth open for a few days to drain. You may also be given antibiotics to help the body control infection that has spread beyond the tooth. During the next stage of treatment, the temporary filling is removed. The pulp chamber and tooth canal(s) are then filled and permanently sealed with a material that prevents bacteria from re-entering the canal. In the final step, a gold or porcelain crown is usually placed over the tooth to restore structure, function and appearance. If an endodontist performs the treatment, he or she will recommend that you return to your dentist for this final step. The type of material used for the crown will depend on where the tooth is located in your mouth, the color of the tooth and the amount of natural tooth remaining. A front tooth that affects appearance, for instance, most likely will be restored with porcelain or a porcelain-fused-to-metal crown. When a back tooth has been badly fractured or decayed, a gold or porcelain-fused-to-metal crown may be used. Your dentist will discuss these options with you. Your endodontically treated and restored tooth could last a lifetime, if you continue to care for your teeth and gums. As long as the root(s) of an endodontically treated tooth is properly nourished by the surrounding tissues, your tooth will remain healthy. Treatment usually requires from one to three appointments. During these treatments, your dentist removes the diseased pulp. 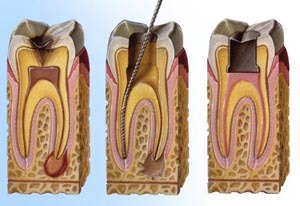 The pulp chamber and root canal(s) of the tooth are then cleaned, shaped, filled, and sealed to prevent recontamination of the root canal system. 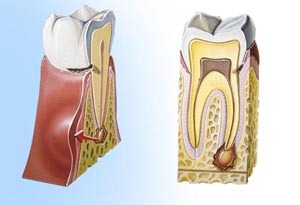 Root canal therapy usually is a relatively painless procedure. If your dentist anticipates that any special care is needed for successful treatment, he or she may refer you to a specialist called an Endodontist. The pulp is a soft tissue that contains the nerves, arteries, veins, and lymph vessels of a tooth. It lies within the dentin, the bone-like tissue that supports the enamel. 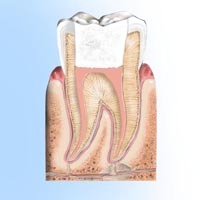 Within the dentin, the pulp extends from the pulp chamber in the crown (the portion of the tooth visible above the gums) down to the tip of the root by way of the root canal. 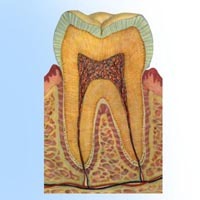 All teeth have only one pulp chamber, but teeth with more than one root will have more than one canal.